This beautiful silvery/blue feather palm has long pinnate leaves that arch and re-curve towards the ground from atop a thick stout trunk. The trunk can grow as tall as 20 feet but is rarely seen larger than 14 feet. Pindos are relatively slow growing palms and they are exceptionally cold tolerant and are well suited to use even up in Zone 8. Pindos that are reasonably well cared for will develop full, lush canopies and are undaunted by freezes into the low 20's / high teens and will survive freeze event into the low teens with just minor damage. Pindos produce a bright orange fruit that if pollinated, will become edible. Pindo palms are native to the grasslands and dry woodlands of South America. 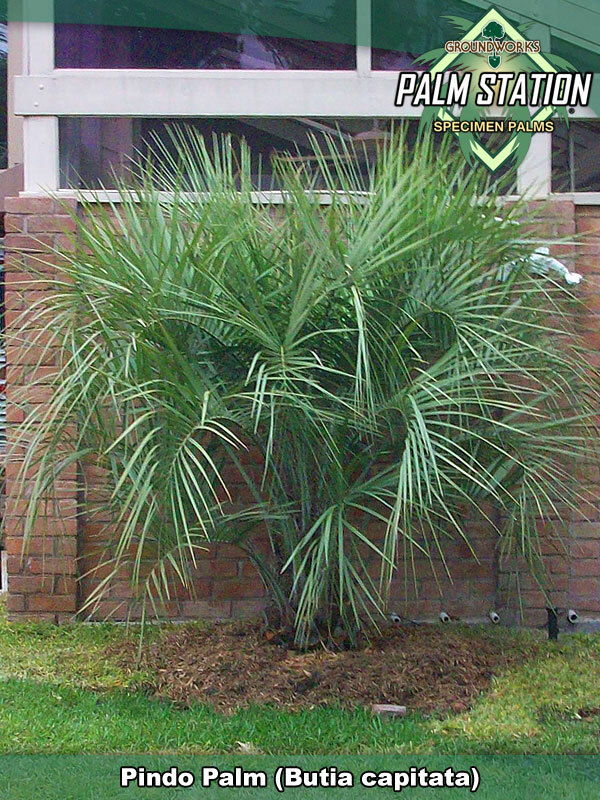 The pindo is a popular landscape item in North Florida and throughout the mild Gulf and Atlantic coastal regions of the southeastern United States. It is also popular in northern California and similar warm winter climates that are subject to frosts. Full sun to moderate shade (the fronds grow longer in shady situations, giving the palm a more graceful aspect than those grown in full sun). Prefers sandy, well-drained soil but is adaptable and very drought tolerant. Regular watering and feeding will produce a faster growing, more attractive palm. USDA Zone 8-9. This is the hardiest feather leafed palm. 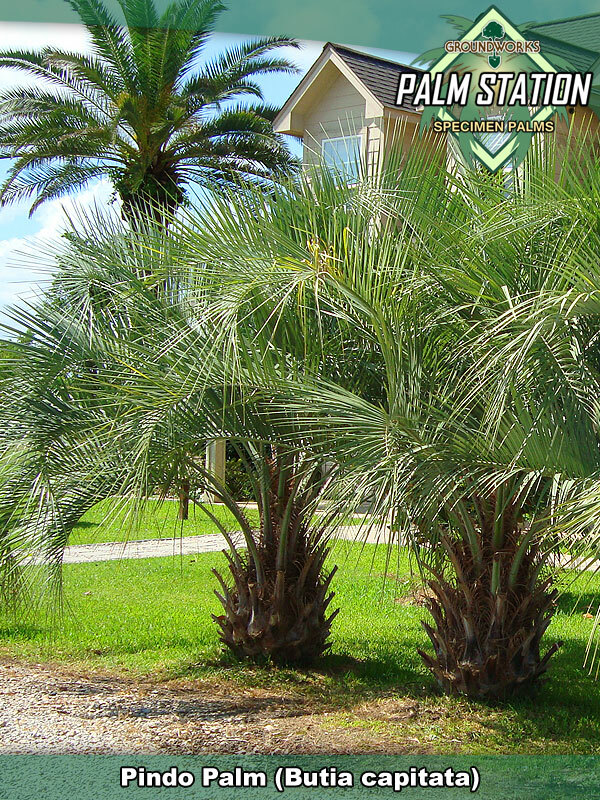 Specimens can be seen in North Carolina and we have had reports of Butia palms surviving as far north as Washington D.C.
Groundworks Texas and Groundworks Palm Station - Houston have excellent availability of Specimen Pindo palms from 1 foot all the way up to 10 feet of clear trunk. Larger sizes are available on a special order basis.